Obesity is much more than just a skin-deep issue, it is a true medical condition that needs active engagement. Not pleased with what you see in the mirror? The harsh reality is that obesity not just robs one of self-esteem and confidence, it is also strongly linked with life-threatening diseases like diabetes, hypertension, high cholesterol and even cancer. 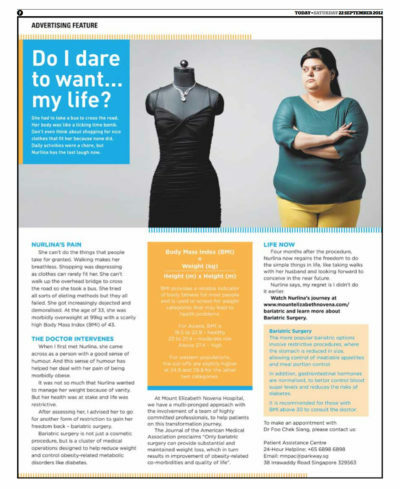 As part of the campaign to create awareness of the ills of obesity, and the surgical options available for the treatment of morbid obesity, Mount Elizabeth Novena Hospital has partnered Dr Foo Chek Siang in a series of Editorials on Bariatric Surgery (Bariatrics) and Weight-Loss Surgery. In these bariatrics and weight-loss surgery editorials, the testimony of Nurlina has been documented, illustrating how the sleeve gastrectomy has helped her in achieving her weight-loss goal, at 4 months after surgery. Bariatrics and weight-loss surgery is not considered cosmetic surgery, but is a cluster of specific operations to reduce weight and control obesity-related diseases through surgery at the root of the problem. Bariatric and weight-loss surgery targets the gastrointestinal system and its associated complex neurohormonal network involved in the intricate balance of satiety (the feeling of fullness after a meal) and glucose metabolism (concerning diabetes). By targeting deeper than just body contouring, bariatrics and weight-loss surgery achieves better weight-loss that is sustainable, compared to other medical modalities of exercise, pure dieting and medication. The results of bariatrics and weight-loss surgery has been well-studied and established, that the Journal of the American Medical Association proclaims “ONLY bariatric surgery can provide substantial and maintained weight loss, which in turn results in improvement of obesity-related co-morbidities and QUALITY OF LIFE”. Take charge of your weight today. To find out more on how you can benefit from bariatrics and weight-loss surgery, contact Clinic for Digestive Surgery at +65 6570 2702 to speak to SSN Karen, our Clinic Nurse. Alternatively, you could drop us an email at doctor@clinicfordigestivesurgery.com, or fill up the enquiry form at http://clinicfordigestivesurgery.com/contact and we will attend to your needs at the soonest opportunity.